2017 Liquid Force Rocket Foil Set. The 2017 Liquid Force Rocket Foil Set is easy. To ride kite foil, with the long fuselage, low aspect wings, and skinnier mast. Just over a year ago Liquid Force reinvented the foil industry by introducing the now legendary Foil Fish. The next generation model Rocket Fish has arrived with huge improvements. Improved performance in shape, weight, adjustability, and durability. The Rocket Fish Hydrofoil is easy to ride and very affordable. Here are a few of the features the team here at Force Kite and Wake recognize. Fiber glass wings- We all know that it is possible to hit bottom every session. The fiberglass wings are very strong and easy to repair or replace. Low Aspect ratio wings are great of light winds because they allow you to get up gliding at very low speeds, this is also a great advantage when learning. The 71cm fuselage is the longest in the industry. This is a huge advantage over every competitor model because it makes the board less sensitive when shifting your weight and minimizes the Dolphin dive up and down motion. Made out of solid aluminum. Yes, it adds weight, but knowing that you may hit the bottom this adds strength where needed without compromise. The removable fuselage brings two huge advantages. Now a quarter inch thinner than the Foil Fish. Less drag without sacrificing durability. The New adjustable track mounting system is a huge improvement. Allowing you to choose the most comfortable position for your session. INTERCHANGEABLE PARTS: There are two crucial benefits to having separate parts with this simple design. First, each part can be easily assembled and taken apart. This allows the foil to be easily stored when traveling long distances to the beach and not have to end up hanging out of your sunroof or leave it sticking out of your car trunk. Second, each piece of the foil set is easily replaceable. If you happen to break anything, a new part can be installed fast, and you do not have to order an entirely new foil. Be on the lookout for the release of new Liquid Force foil parts including an extended fuselage, wider mast, as well as medium and high aspect wings. These new parts will allow you to experiment and customize your foil board to your desired feel when riding. RELIABLE DURABILITY: Another great feature is the durable, aluminum extrusion construction. Focused for the beginner and all the way to advanced foil border, this gives you the confidence to crash without worrying and is a huge benefit if you are hard on your gear. Here at FORCE, we are constantly dealing with shifting sandbars and moderate tides, which can sometimes lead to hitting bottom and crashing hard. Luckily the Liquid Force Foil Fish package stands up to the beating and we can continue to foil! We also off the option of customizing your mast to a shorter length allowing you to avoid any problems in shallow water. Evolution, progression, and succession highlight the performance of the extremely affordable, easy to use Rocket Kite Foil. This hydrofoil setup is an ideal addition to any kiteboarders arsenal of equipment. Highlighted by a multi purpose adjustable mast mounting system board, thin profile mast, adjustable fuselage and low aspect bomb proof polymer low aspect wings make this the best free riding set ups on availability. Are you missing on those light wind days? You can still have fun in below 10mph winds. All that you are missing is the foil set. It's affordable, built for progression and includes easy low aspect wings. This is the foil for people and gets ready to fly it! Kiteboarding is all about having the most fun while progressing your riding to the next level. The Liquid Force Foil Fish package offers just that an is the perfect setup to introduce you to foil boarding. This foil package has plenty of features at an incredible price, giving you a lot more for what you pay for in comparison to similar products. 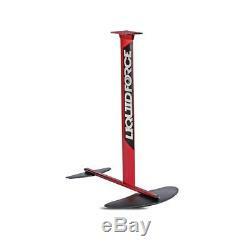 See How Liquid Force Rocket foil compairs to the Happy Foil. FORCE Kite and Wake is one of the largest retailers of kiteboarding equipment in the country. We stock hundreds of kites, kiteboards, harnesses, and accessories. All of our employees are experienced kiteboarders. The item "2017 Liquid Force Rocket Foil Set" is in sale since Saturday, September 16, 2017. This item is in the category "Sporting Goods\Water Sports\Wakeboarding & Waterskiing\Wakeboards". 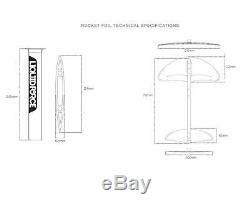 The seller is "forcekiteandwake" and is located in Mount Pleasant, South Carolina.